^ Rawski 1998， p. 50 ("probably a rendition of the Mongol noble title, Khongtaiji"); Pang & Stary 1998， p. 13 ("of Mongolian origin"); Elliott 2001， p. 397, note 71 (Khong tayiji was "quite common among the Mongols, from whom the Jurchens borrowed it"). ^ Elliott 2001， p. 397, note 71 (Khong tayiji as "meaning loosely 'Respected Son'"); Miyawaki 1999， p. 330 (derivation from huang taizi and other meaning as "viceroy"). ^ Grupper SM. 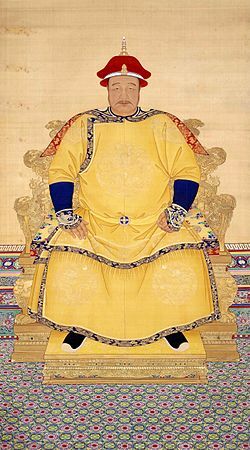 Manchu patronage & Tibetan Buddhism during the first half of the Ch'ing Dynasty. J. Tibet. Soc., no 4, 1984, p. 69. ^ 王佩環. 清宫后妃. 沈阳: 辽宁大学出版社. 1993年12月: 15. ISBN 978-7-5610-2144-6. Rawski, Evelyn S. Ch'ing Imperial Marriage and Problems of Rulership. (编) Watson, Rubie S.; Ebrey, Patricia Buckley. Marriage and Inequality in Chinese Society. Berkeley: University of California Press. 1991: 170–203. ISBN 0-520-06930-7. Pang, Tatiana A.; Giovanni Stary. New Light on Manchu Historiography and Literature: The Discovery of Three Documents in Old Manchu Script. Wiesbaden: Harrassowitz Verlag. 1998. ISBN 3-447-04056-4. Miyawaki, Junko. The Legitimacy of Khanship among the Oyirad (Kalmyk) Tribes in Relation to the Chinggisid Principle. (编) Reuven Amitai-Preiss and David O. Morgan (eds.). The Mongol Empire and its Legacy. Leiden: Brill. 1999: 319–31. ISBN 90-04-11946-9.